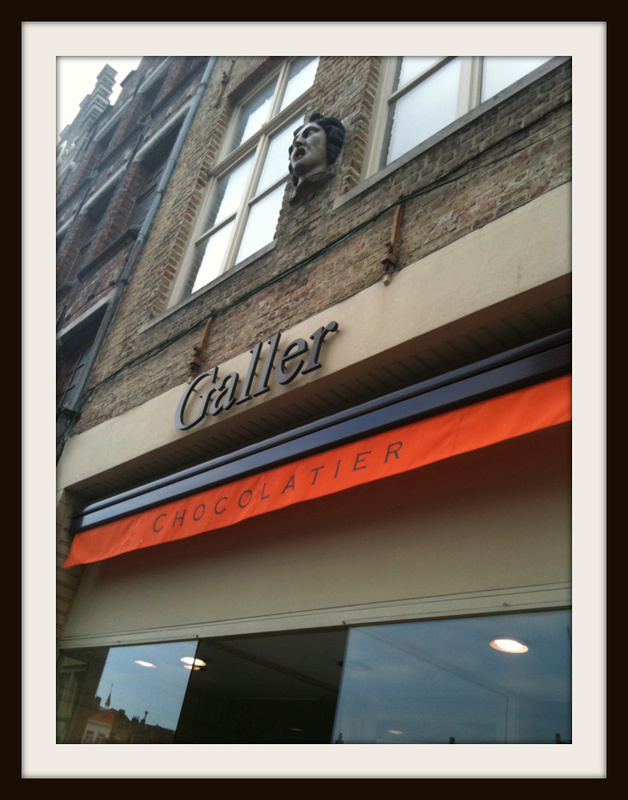 This was the most unexpected surprise of our Chocolate pilgrimage. We were just strolling down the Champs Elysée from the Place De la Concorde on our way to the Arc de Triomphe. 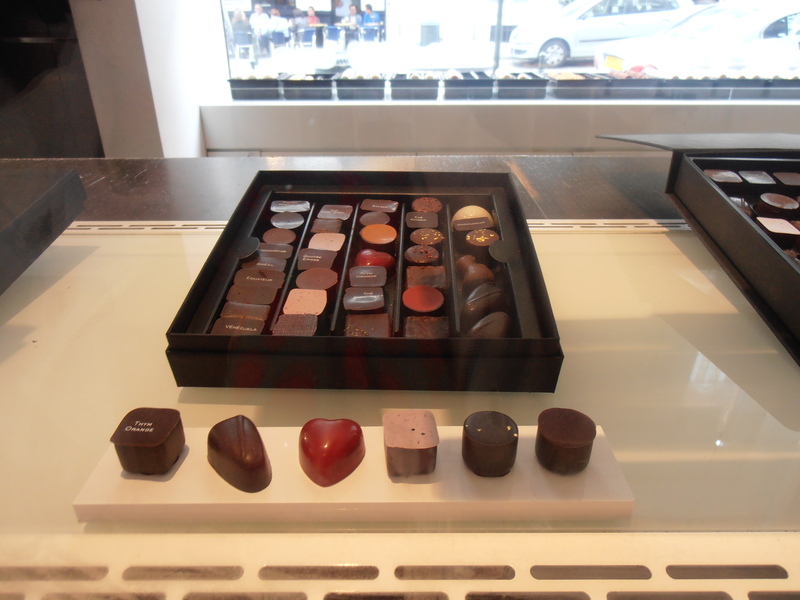 We planned to have side trip to “Fouquet” on the avenue on the recommendation of Charlotte (a Belgian chocolate fanantic we met in Bruxelles ) to share a hot chocolate and people watch. ” Quatre chocolat chaud monsieur s’il vous plait”?. The plan was abruptly interrupted when a pale green facade with a small yet stunning window display of patisserie, confection and chocolate perfection beckoned us. This window teased us into peering in the front door. 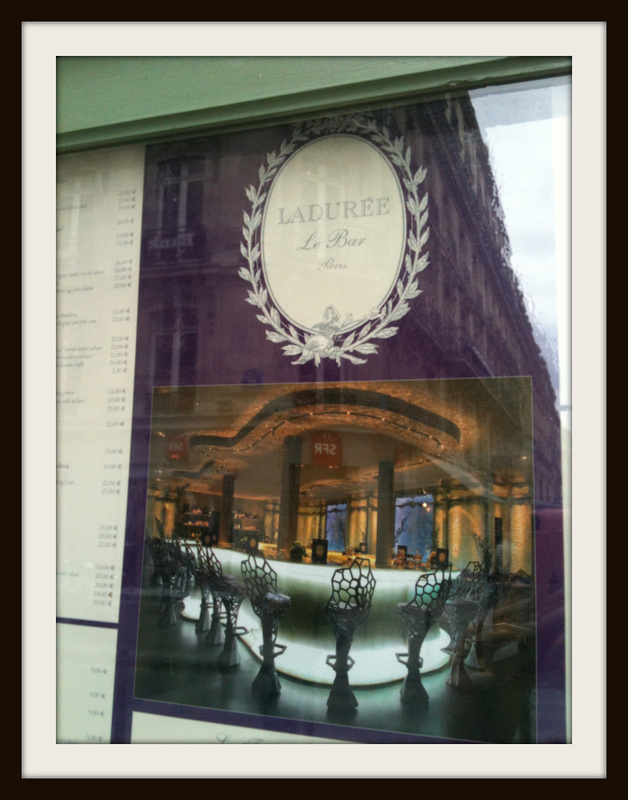 We had planned to see Laduree at Rue Royale however here we were and we were hooked. The tight doors swung open. We were in. Laduree as all the books suggested was irrestistable. Inside, darkness flooded room . 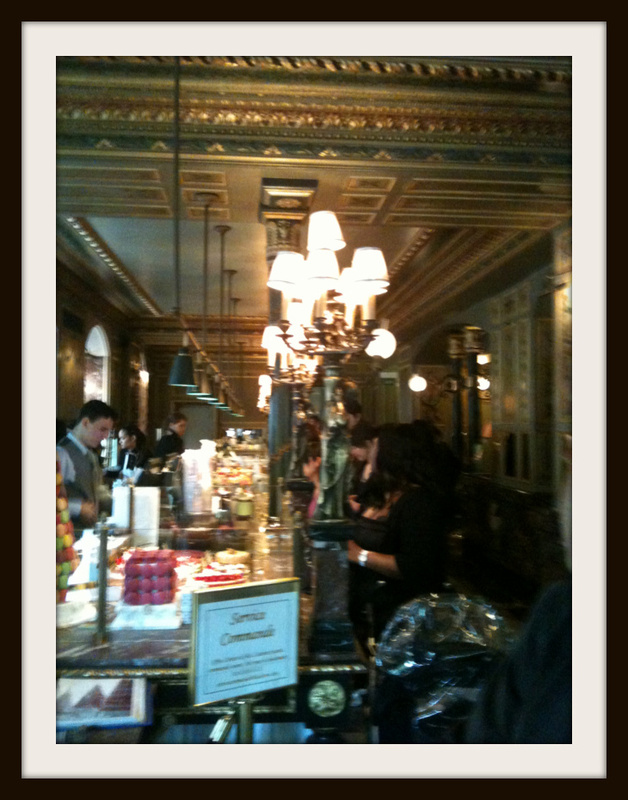 The only lights in this Salon were those fixed on the exquisite delights of Laduree displayed on marble (Chocolate eclairs, chocolate mille feuille, gateaux, macarons and a selection of Truffles and chocolates). Ladurees decor was classic. 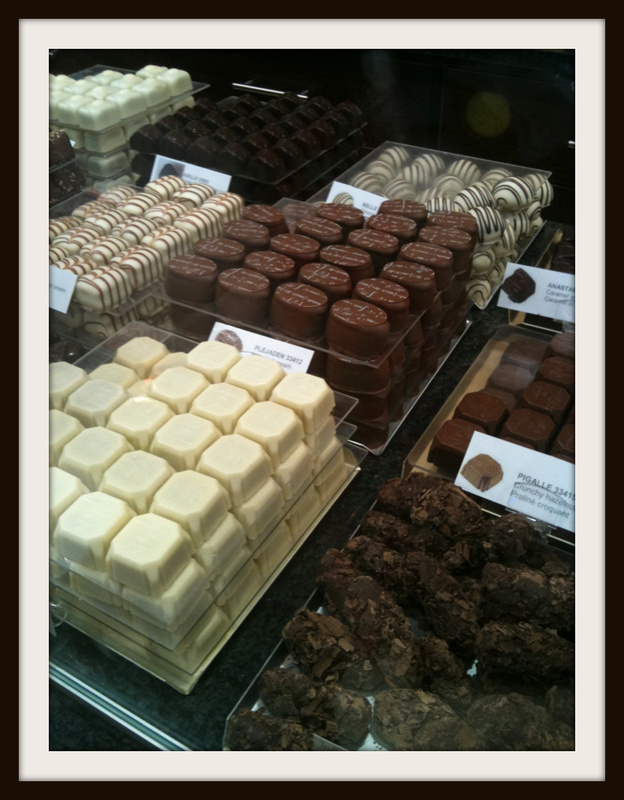 The best of all the Chocolate destinations we’d seen so far. As were the crisply pressed black uniforms of the Mademoiselles Ladurees. 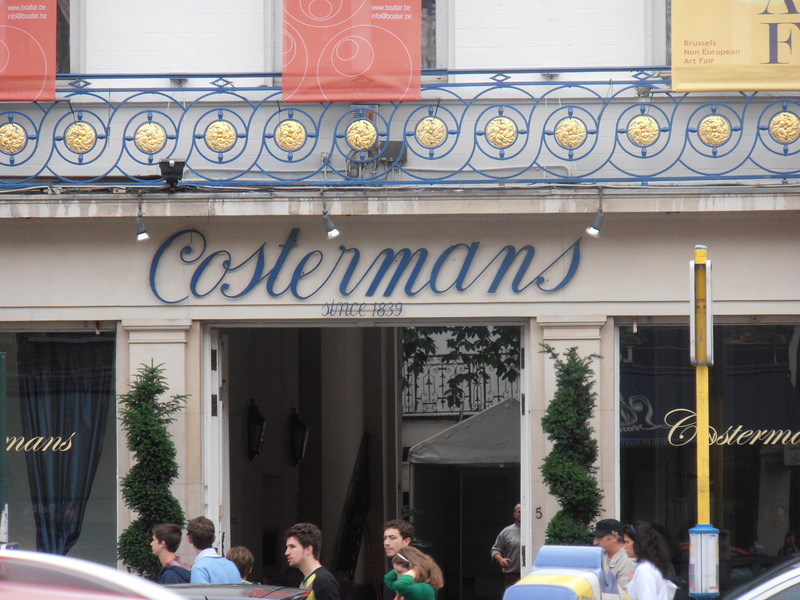 Their efficient ,clinical and polite service always finishing with “Ces tout”? It was hard to answer “Oui, that’s all” as you just wanted to buy all the pasrties and chocolates in this boutique. 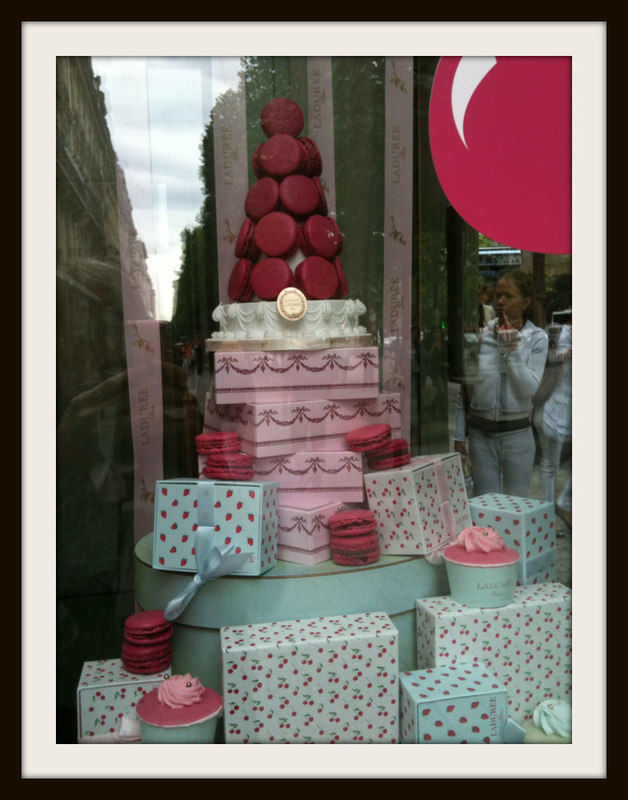 Laduree is best known apparently for its Macarons which it claims to have created. 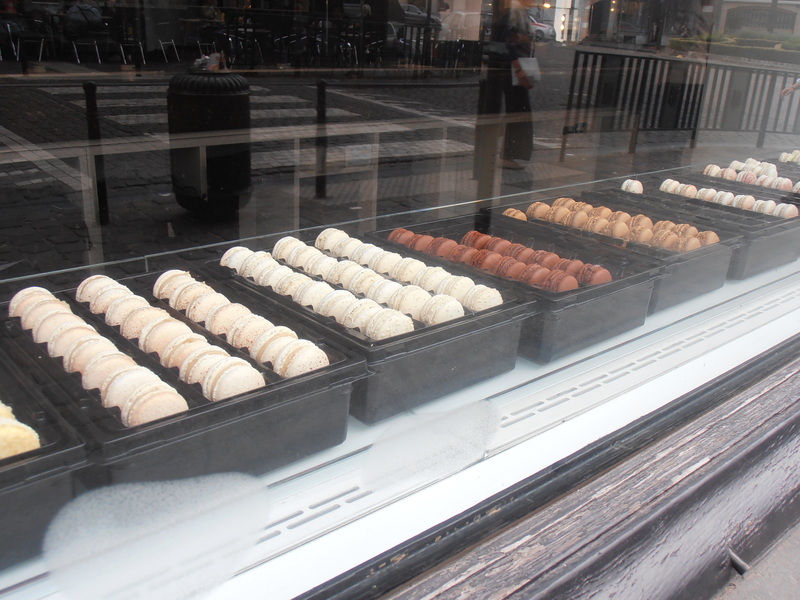 They offer a standard range of Macarons including chocolate, hazelnut, rose, pistachio, raspberry and lemon and add a new flavour for each season. The atmosphere and the amazing cakes made it easy to see why Sofia Coppola used Laduree in her movie Marie Antoinette to illustrate the decadence of the 18th century French royal court. 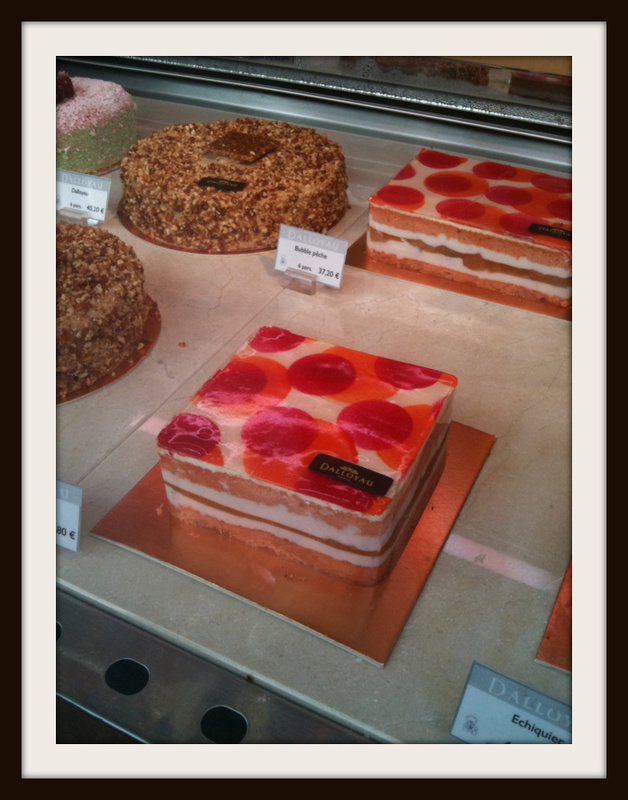 The cakes are like works of art – almost impossible to make a choice and almost certainly too gorgeous to actually eat. But eat we did and they were amazing! At the back of the store there is a Macaron bar (see below) – an almost fantasy of underwater mermaid life the decor is worth seeing. 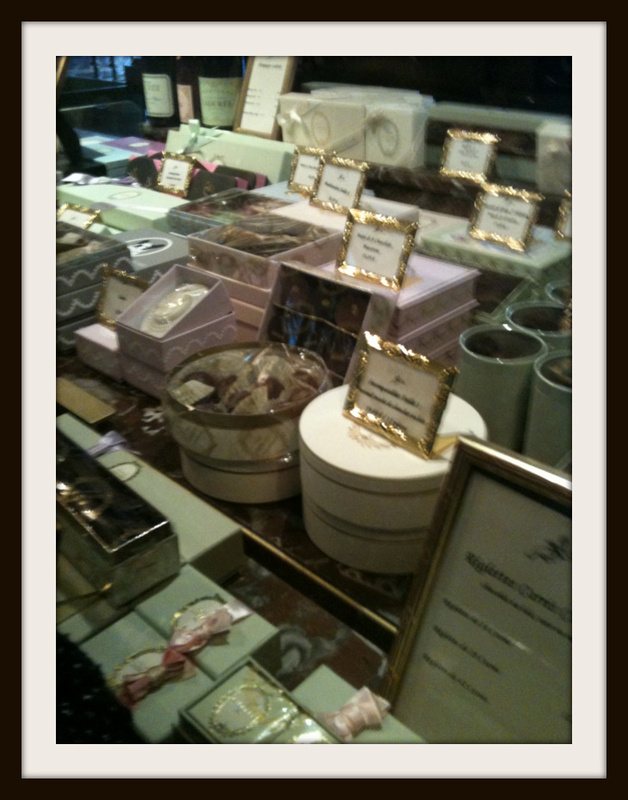 Laduree offers a huge range of chocolate and chocolate gifts – all packaged in beautiful colour coordinated pastels boxes and ribbons. If it seems like these delicacies may look great but not taste great we can testify that we tried several on offer including this most beautiful strawberry below and it was devine! 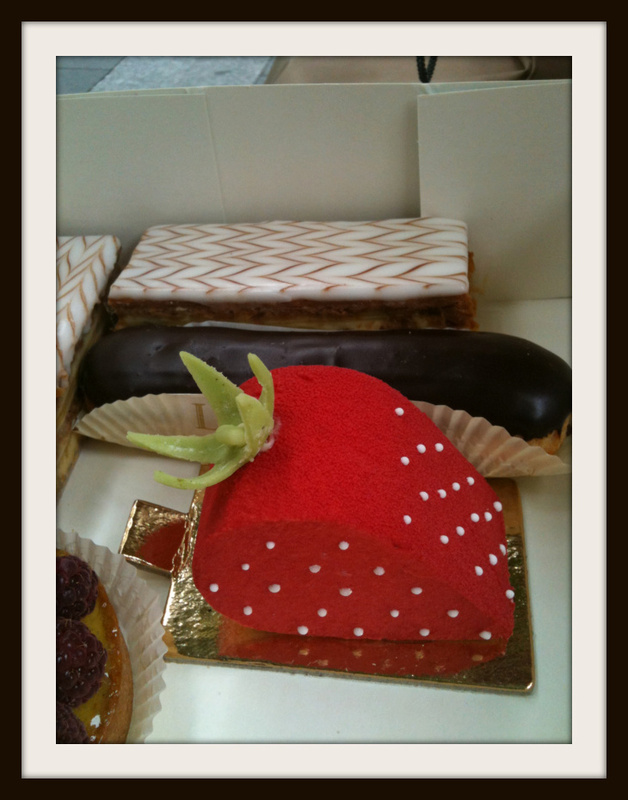 a strawberry from Laduree that looks as good as it tastes! 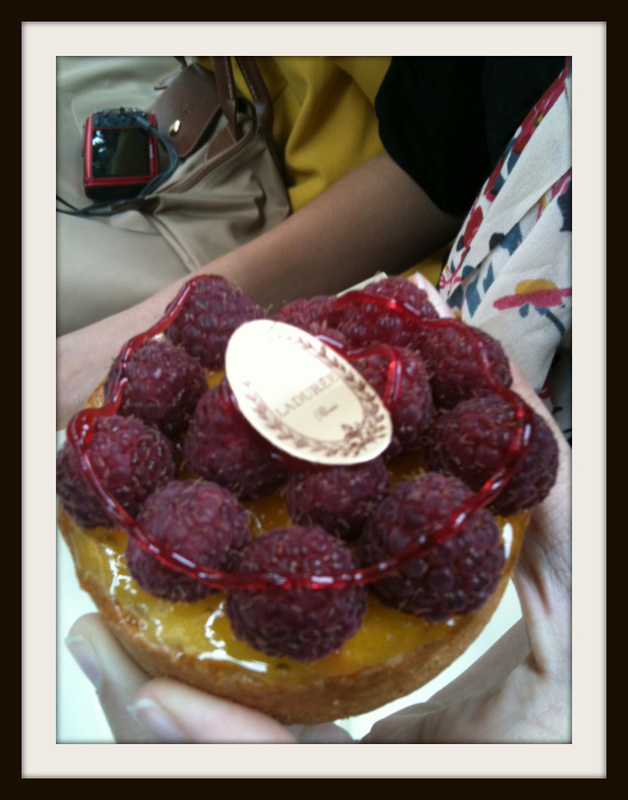 Laduree, merci beaucoup. You made our Parisian day. 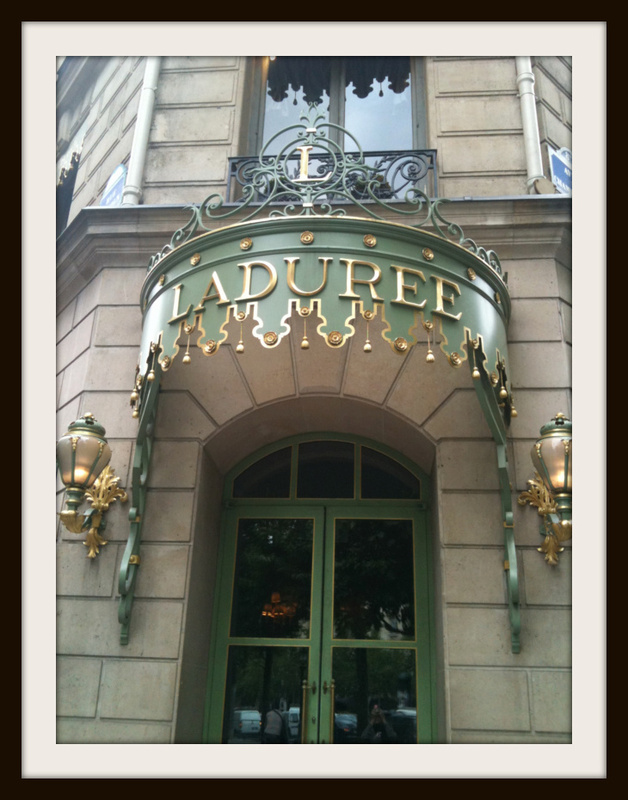 Oh and there are several other Laduree locations in Paris – we will just have to check them out and let you know if they are as good! 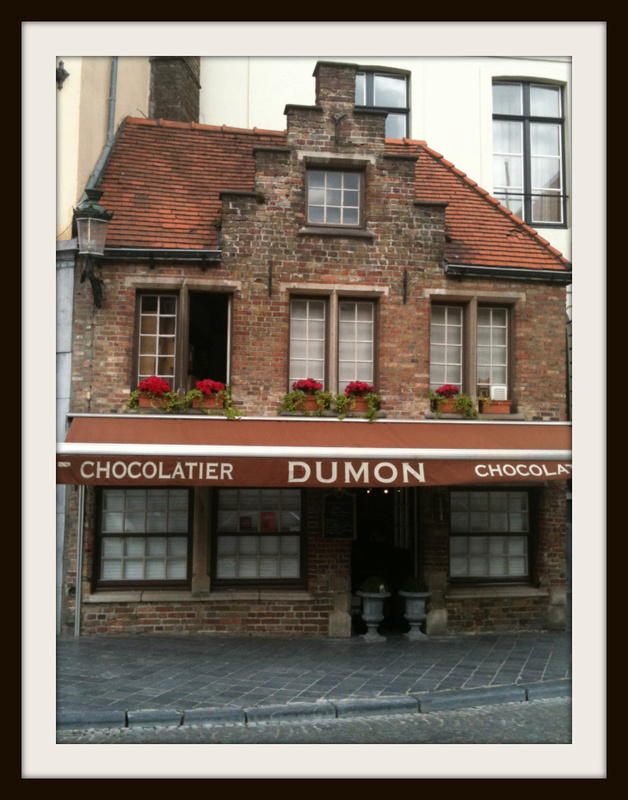 It seemed the shops and choice of chocolate were endless in Brugge – Belgian Chocolate in any form or flavour that you could ever imagine. 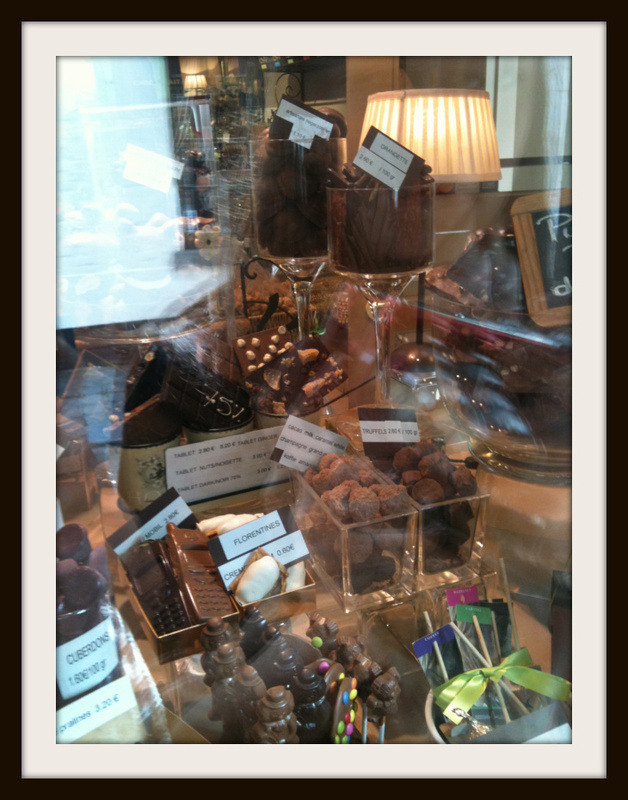 Here are some photos of just a few of the chocolate shops we experienced. 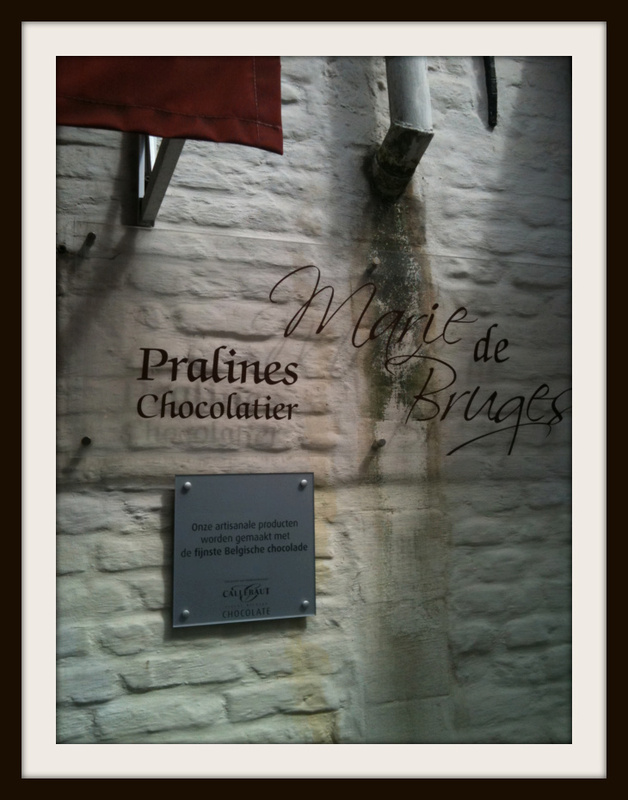 Recent Dello Mano bride Tammy suggested that Brugges in Brussels was well worth a visit. 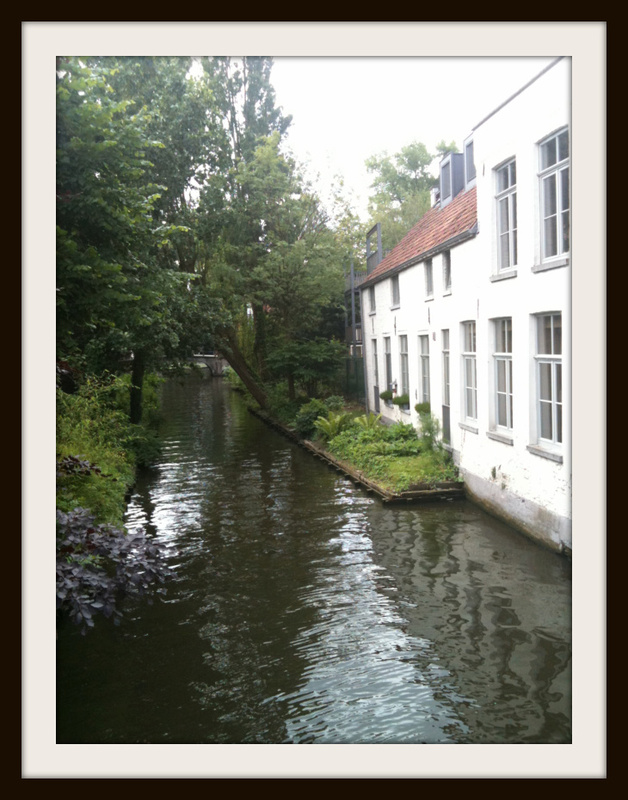 So, in the name of chocolate we ventured out on the hour long train trip to Brugges which is the most quaint picturesque medieval town with the added bonus of hosting some 53 chocolate shops! We were overwhelmedwith the long list of chocolate shops so we made a selective choice based on the most innovative through to the oldest and of course had a keen interest in those that offered hand made chocolates. Noteworthy (and a little sad given our love of hand made food) is that the Information people noted that only about 6 of the 53 stores actually hand made their chocolate. 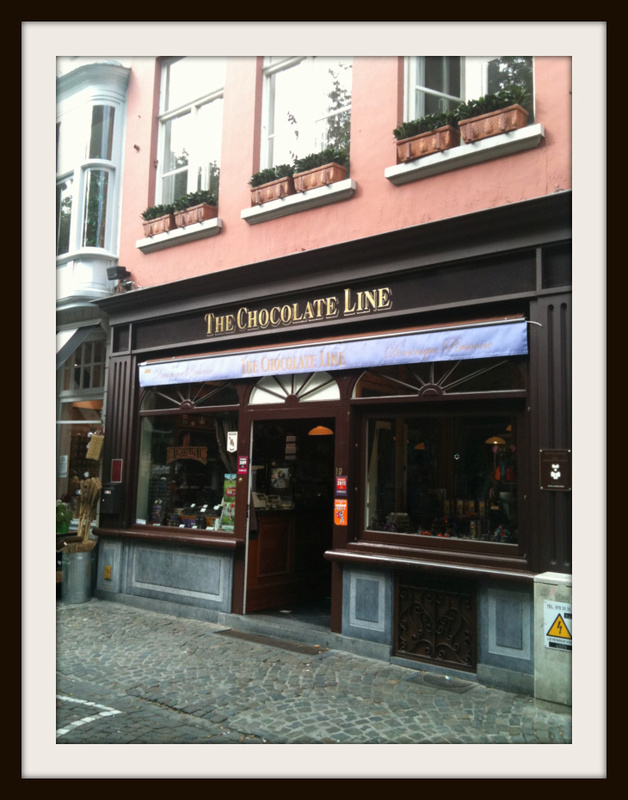 The Chocolate Line store was recommended as both hand made and the most innovative Belgian chocolate shop in Brugges. 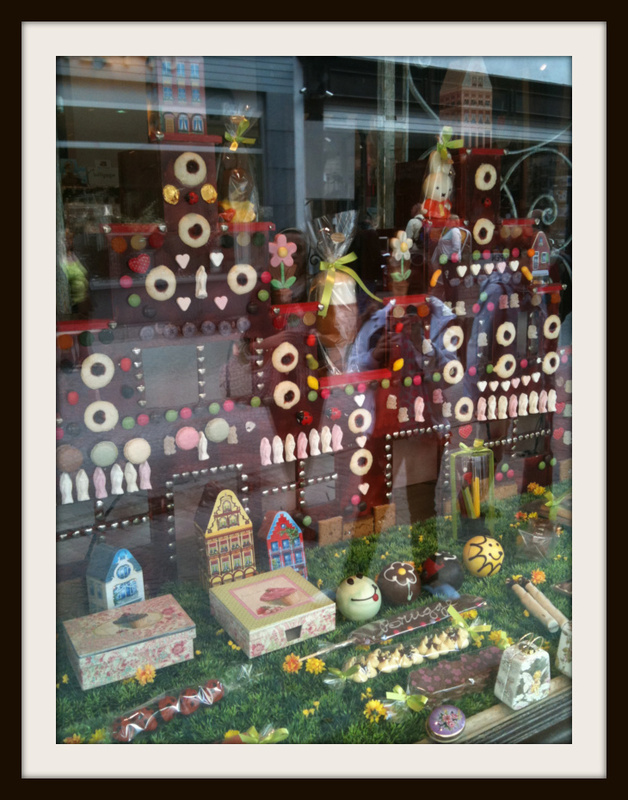 A gorgeous little store with a double window chocolate display set on a cobble stone street in a petite tree lined square. The store itself is brim full of chocolate options and does offer some of the more unusual chocolate fillings including anything from herbs through to vodka combinations. 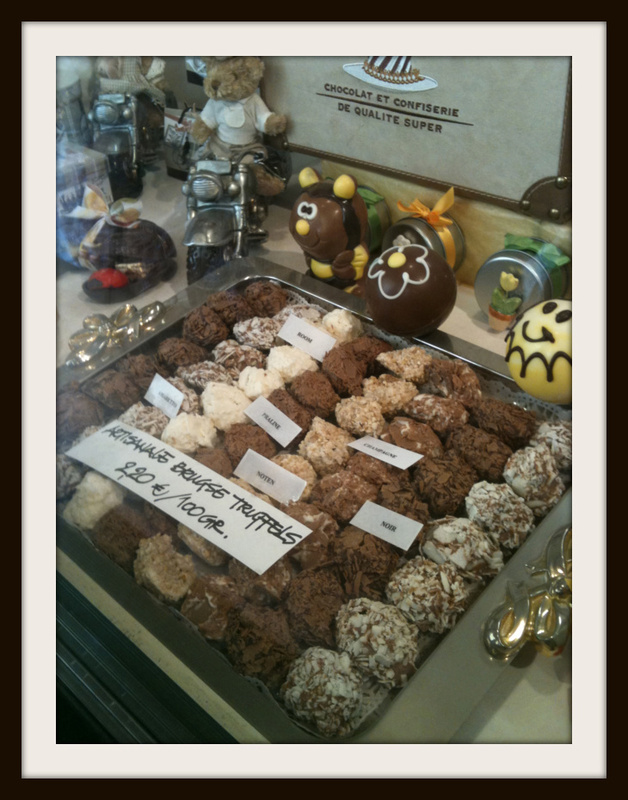 A most unusual choice of chocolate moulded in different shapes including dog poop in the front window -? ….perhaps shock value? Excitingly this chocolate shop does offer authenticity with a large glass viewing window in the back and therefore the opportunity to watch Chocolatiers in action. 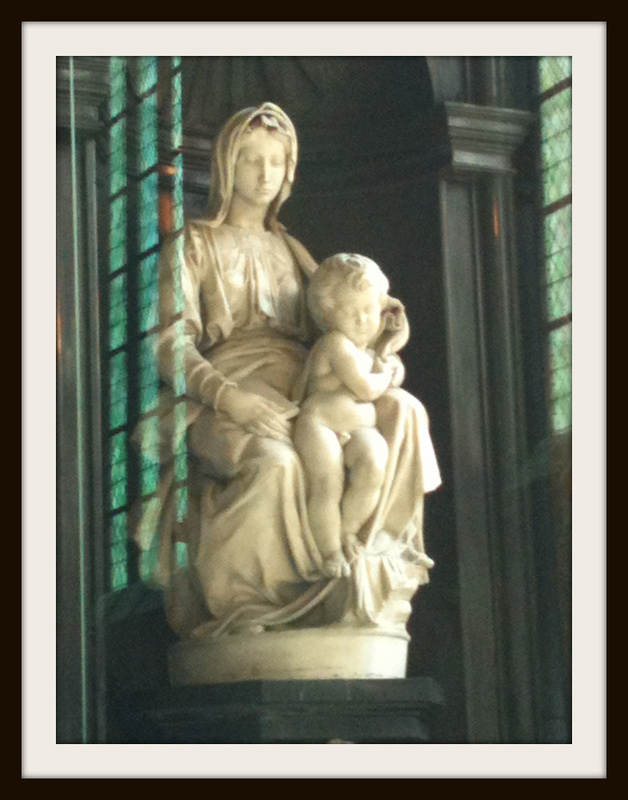 One additional and very unexpected highlight at Brugges was that the Cathedral houses a beautiful Michaelangelo sculpture. This is in fact one of the few Michelangelo pieces outside of Italy. Truly beautiful and with a very light crowd a pleasure to enjoy set amidst the grandeur of the Cathedral. It would be impossible to stroll the pavements of Brussels without being tempted by the irresistible magnetism of the very beautiful window displays. 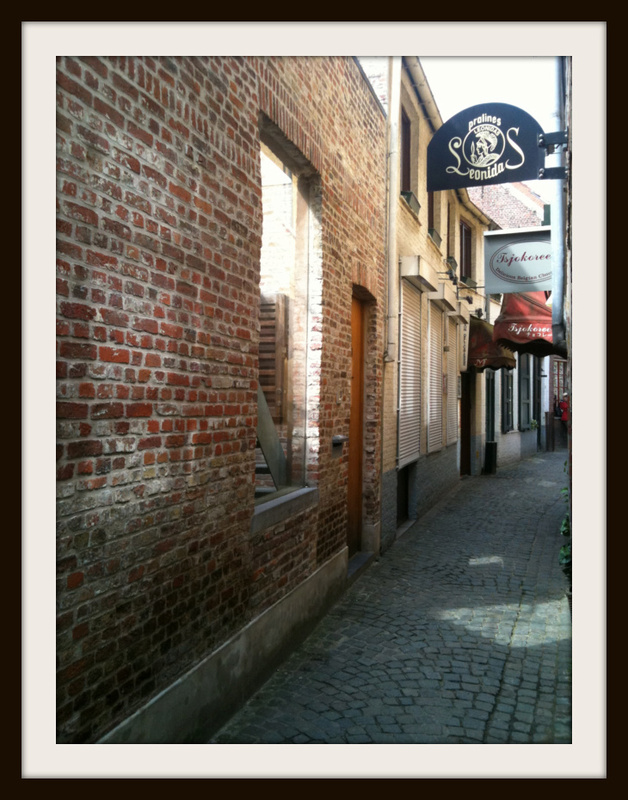 Following a little cobble road from the Grand Place the Mannekin Pis can be found. This little iconic statue has earned a reputation for being very small – many of the locals warning of this at the very mention of the statue. He is in fact very small and more or less sits on the corner of a tiny street. Even more pronounced than the statue is the many, many replicas of him in everything from plaster to yes, you guessed -chocolate. 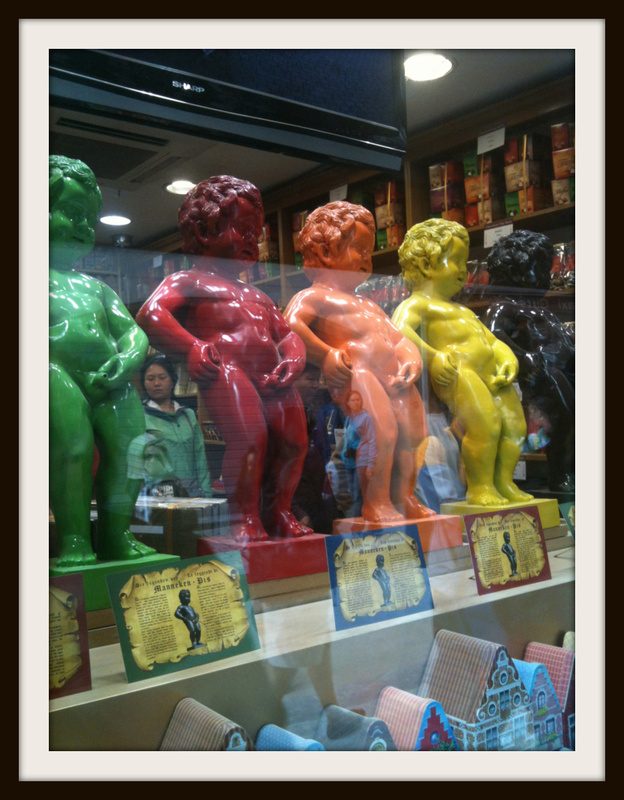 Numerous coloured replicas made for this interesting display in a near by chocolate shop. 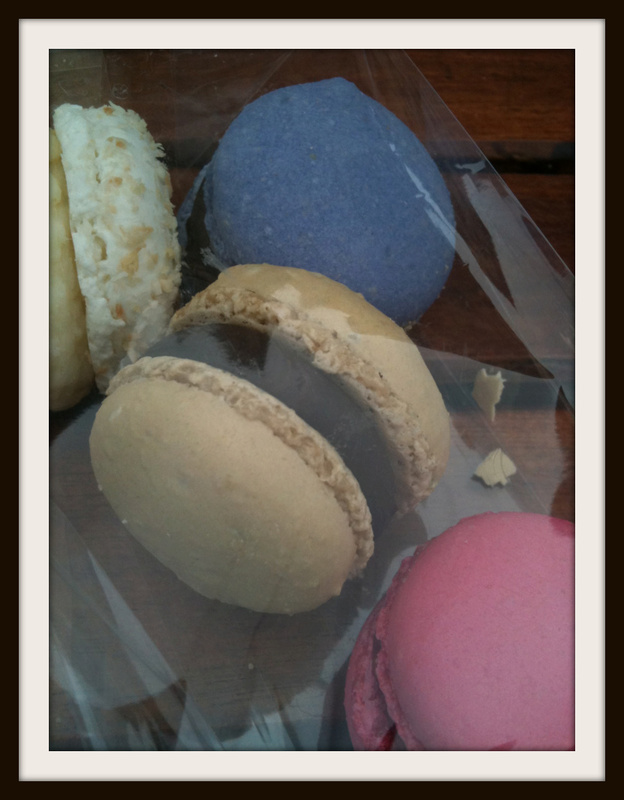 Brussels has its fair share of Macaron stores ranging from incredibly bright colours to the more subdue. Pierre Marcolini perhaps offering the most beautiful and the most sublime texture. Of course all need to be tasted! 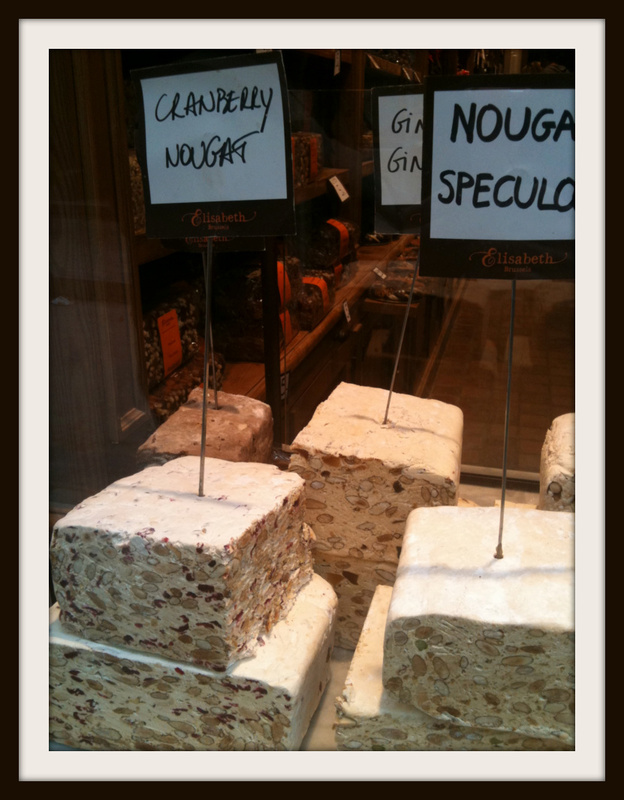 As well as every chocolate flavour known to man, many of the chocolate boutiques offer signature ranges of nougat – many of them very good. 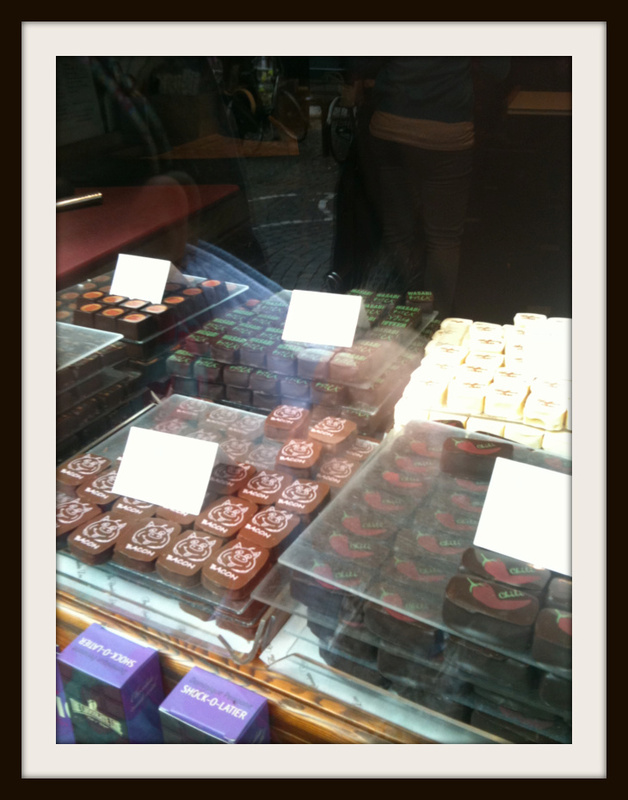 As we posted yesterday, chocolate shops in the Grand Place of Brussels abound – some may say more than anyone could possibly need. 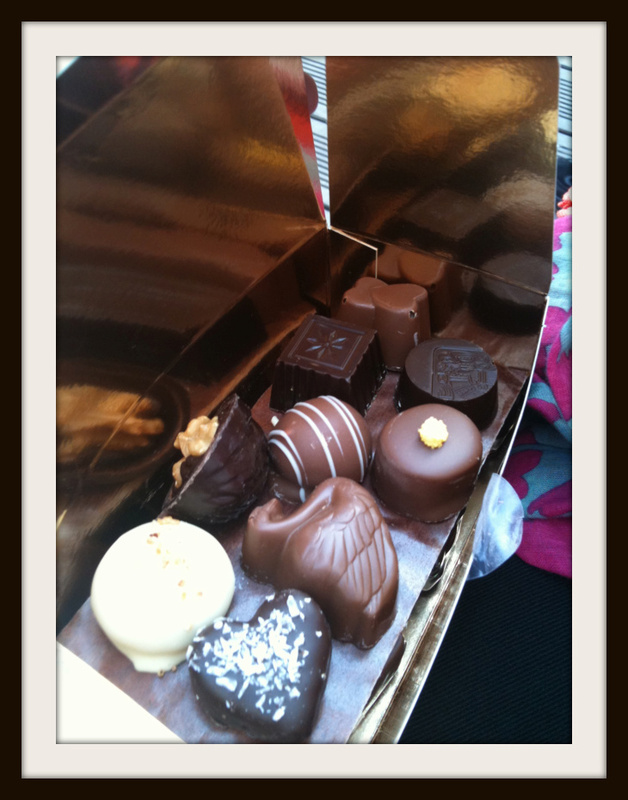 There is in fact a crush of small and big name chocolate shops. 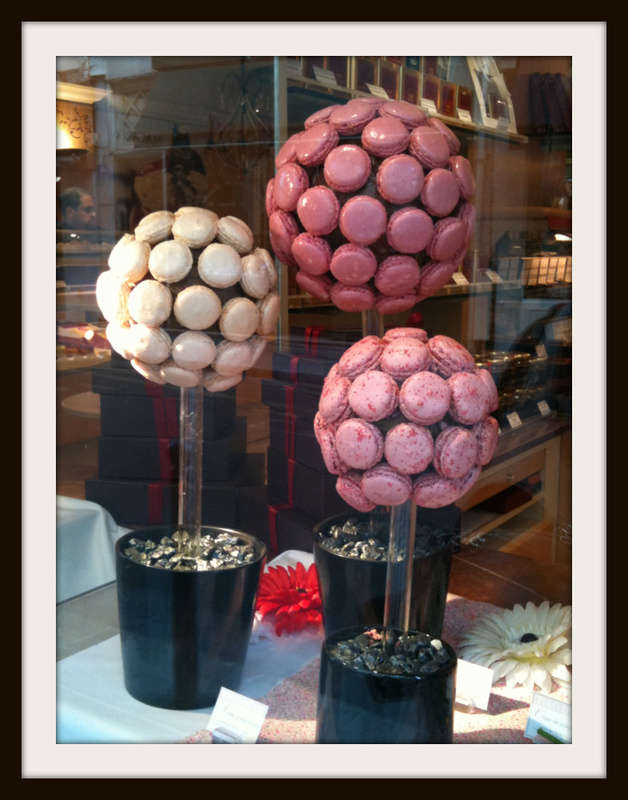 Exploring chocolate shops with the locals however, many recommend a walking trip to the Sablon. 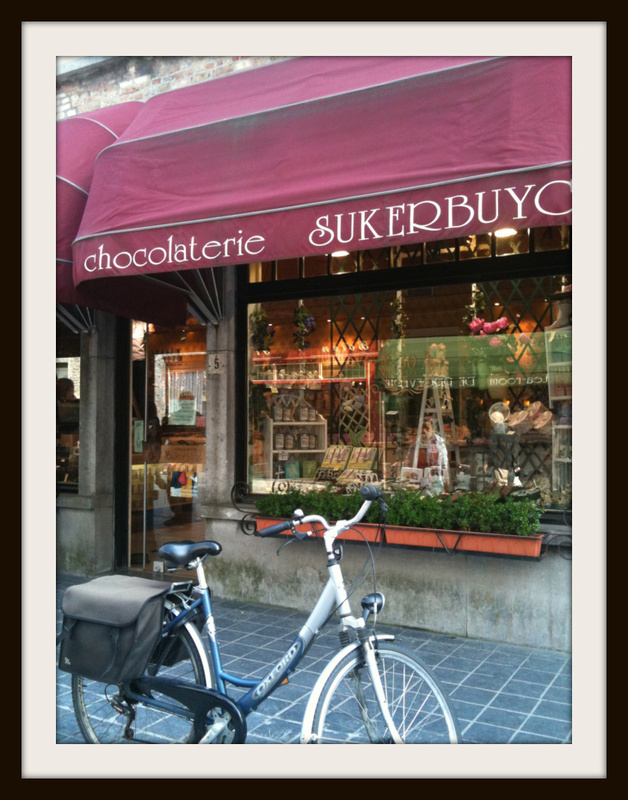 Definitely worth the walk from central Brussels, this quaint rather up market strip of cafes takes the chocolate shop to a new level. 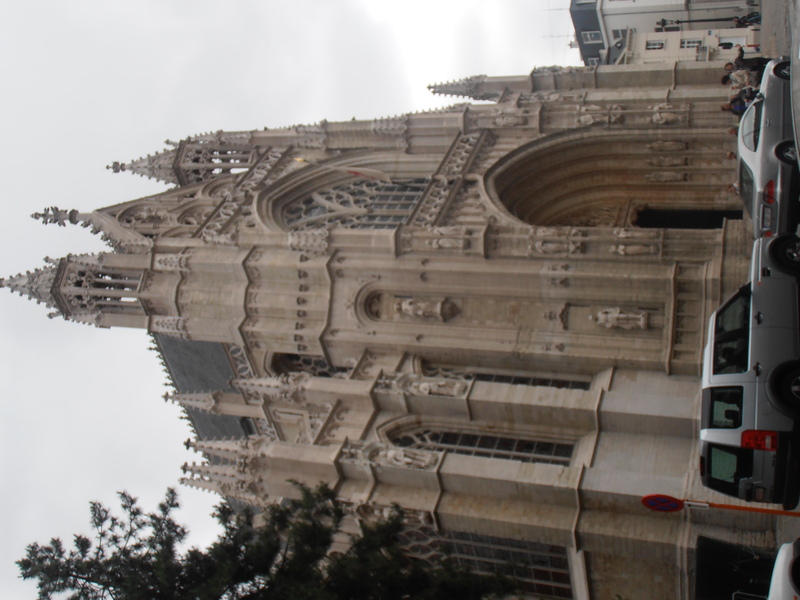 The strip of shops including cafes and more chocolate boutiques sits in the shadow of a glorious gothic Cathedral. 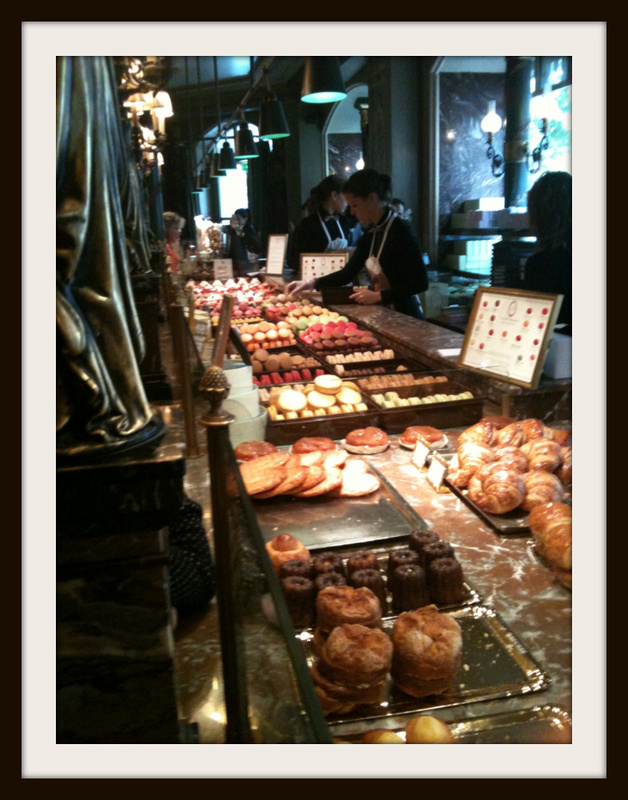 Of all the chocolate shops perhaps Pierre Marcolini was a stand out. 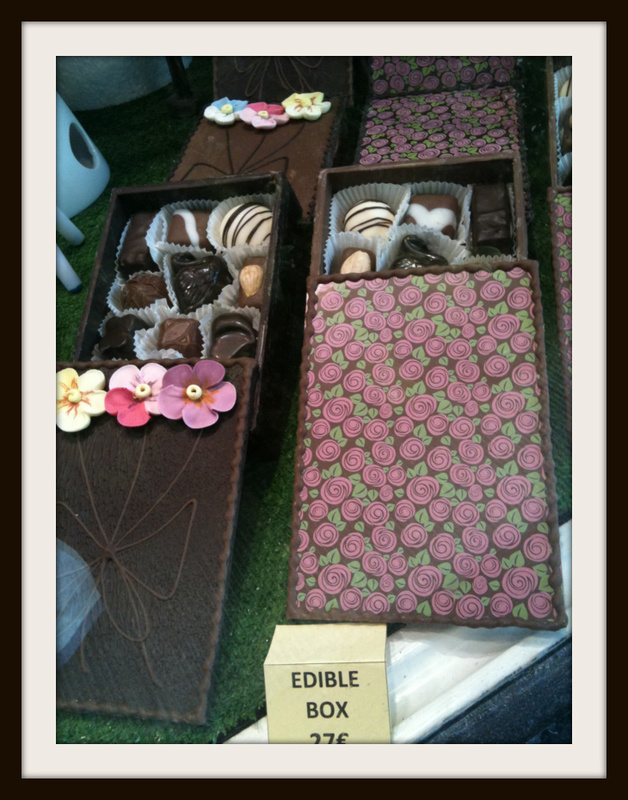 The boutique itself is gorgeous and the chocolate flavours more innovative and tasteful. A number of ranges are offered.